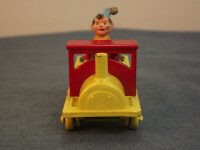 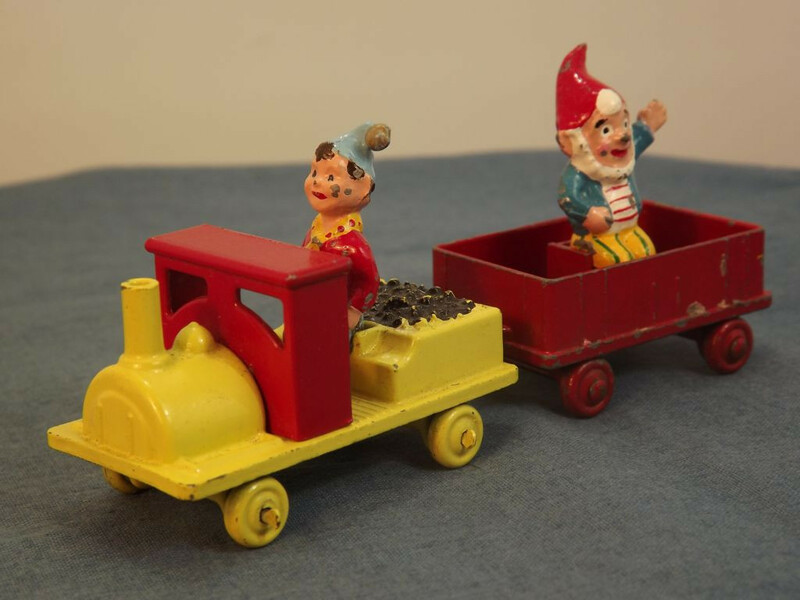 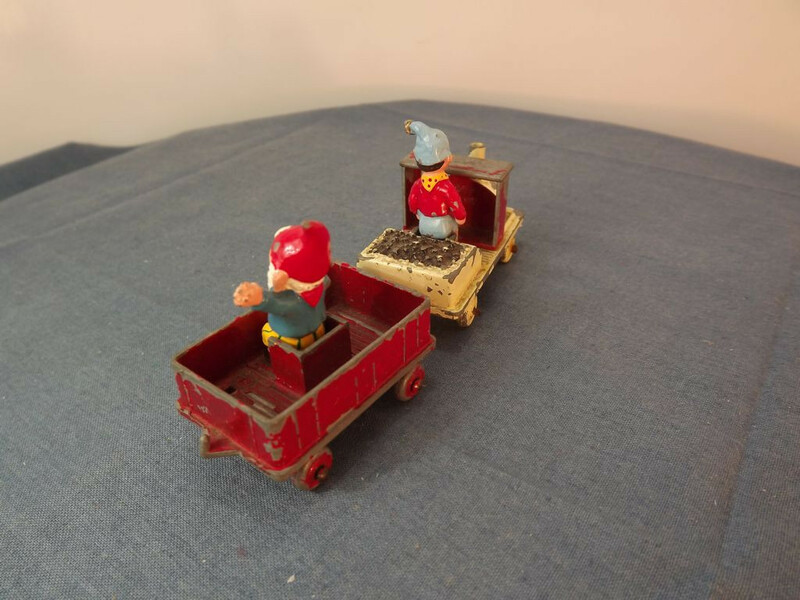 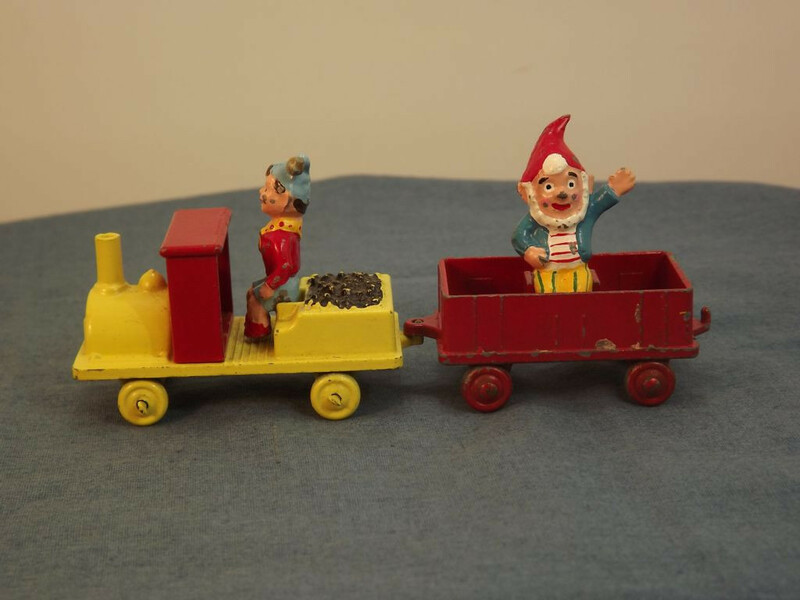 This model is the Budgie 307 Noddy and his Train in Red and Yellow with Noddy and Big Ears figures. 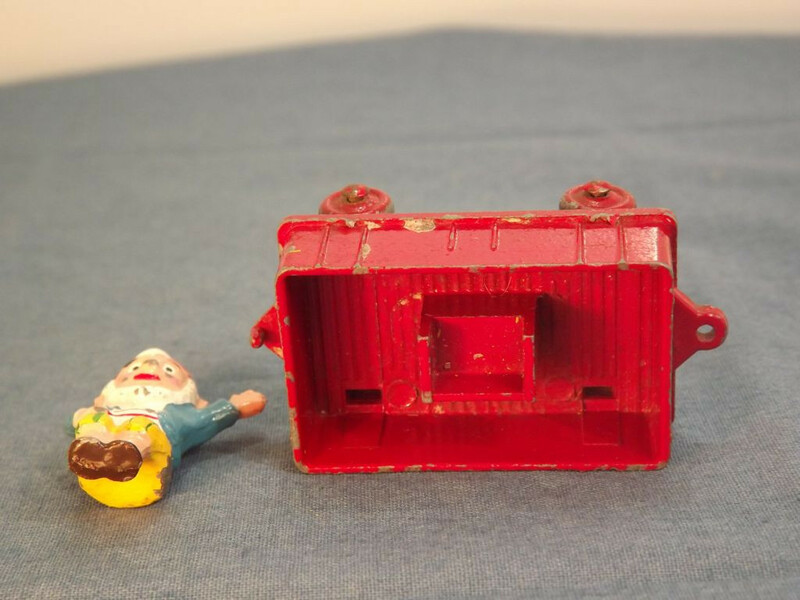 This model has no opening parts and no glazing. 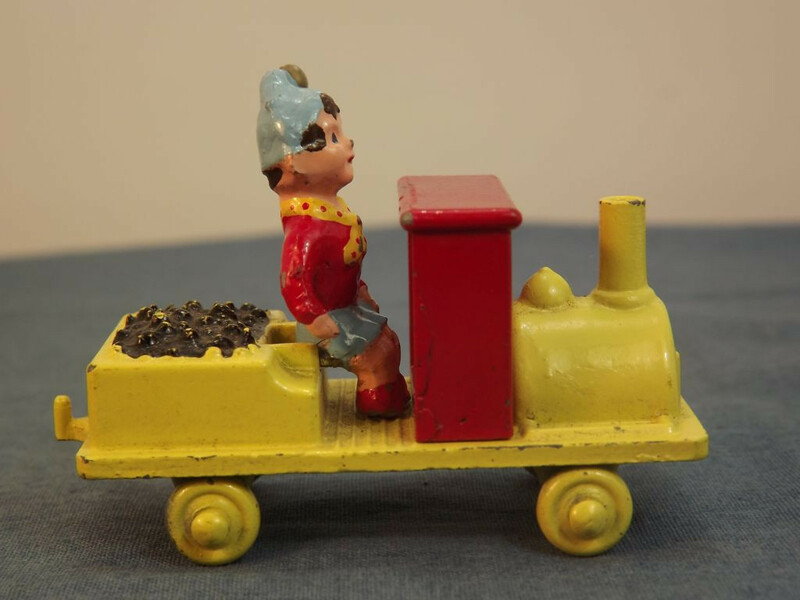 All detail is molded into the body (a three piece casting for the engine) including a boiler door, smoke stack, and steam/sand dome to the front of the cab, seat (for Noddy), coal bin, and towing hook to the rear. 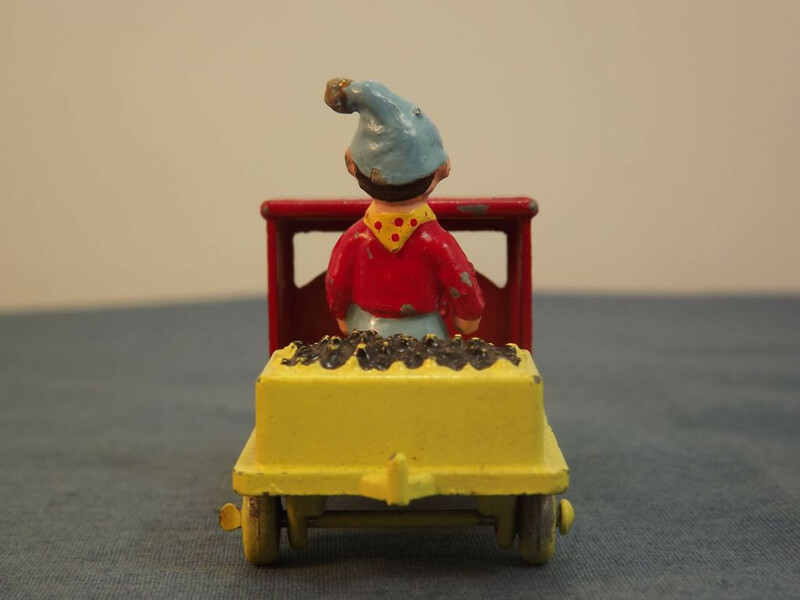 The wagon is a single piece casting with a seat cast into the bed (for Big Ears) and a forward tow slot and rear tow hook. The figures are both molded separately. The engine is yellow with black coal load and dark red cab. 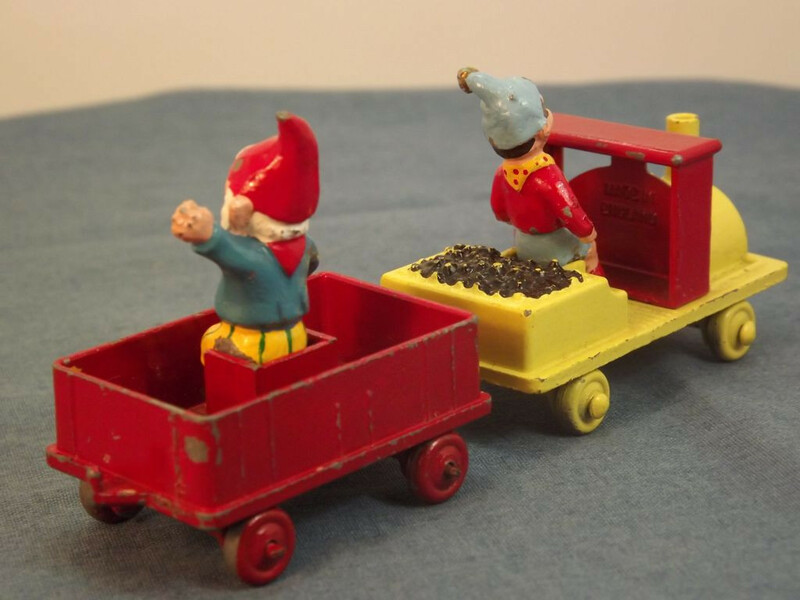 The wagon is dark red. Noddy is painted in his traditional outfit - blue cap, yellow scarf, red jersey, blue shorts, and red shoes. 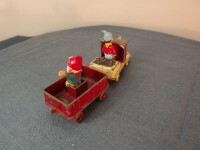 Big Ears is also in his traditional costume - red cap, red scarf (hidden at the front by his white beard) blue jacket, white and red striped shirt, yellow and green striped trousers, and black shoes. 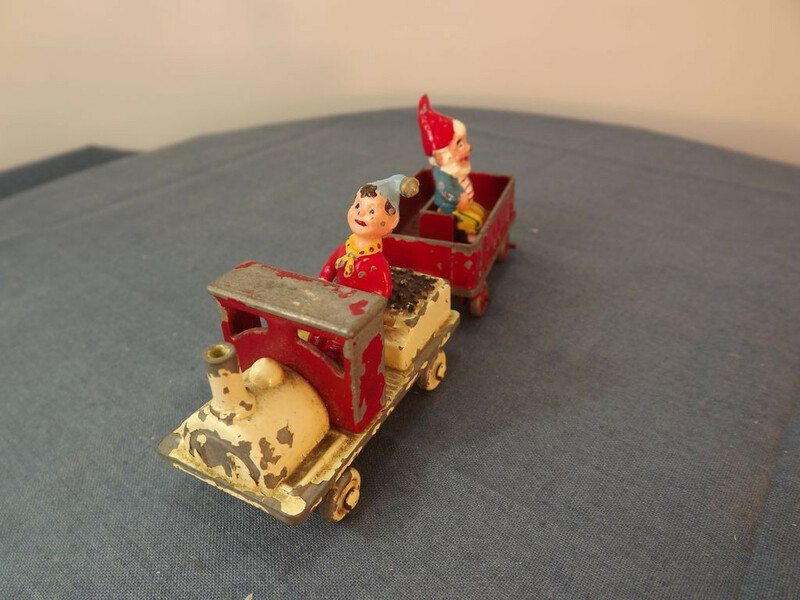 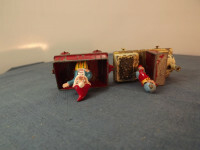 Interestingly, this model came with METAL figures, confirmed as original by the previous owner who had the toy from his childhood, although most references state the model came with plastic figures. All wheels are painted metal (yellow on the engine and red on the wagon) on painted, dome head, crimped axles. 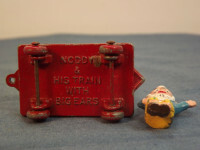 The engine base is painted metal and is marked with "A Budgie" behind the front, "Noddy, &, His Train" on three lines in the centre. 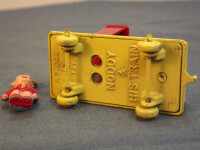 "Made in England" is cast into the cab which is attached to the base by two machined rivets. 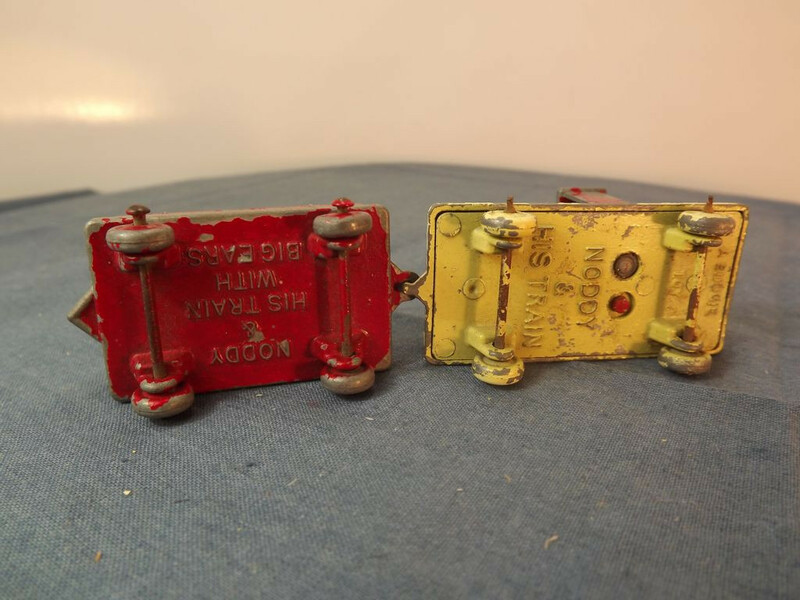 The base itself is also attached to the engine body by two machined rivets. 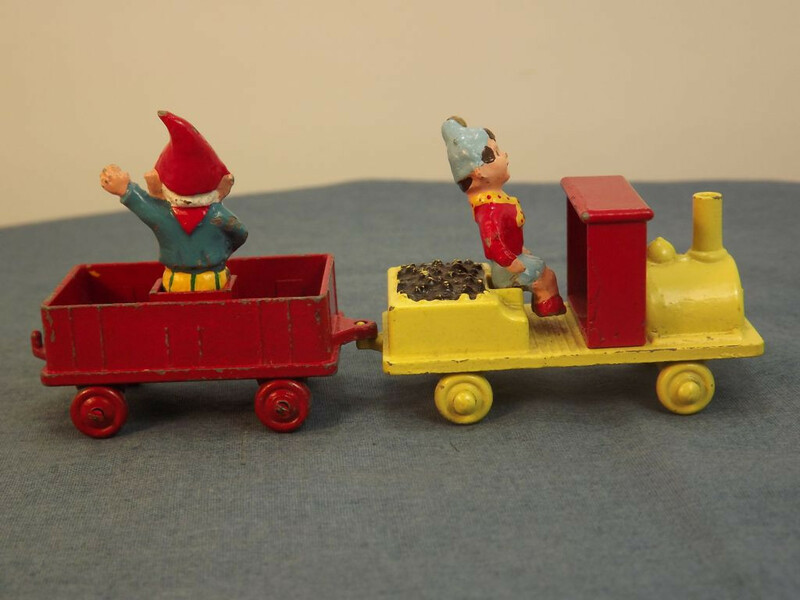 The base of the wagon is part of the body casting and is marked "Noddy, &, His Train, With, Big Ears" on five lines between the axles. 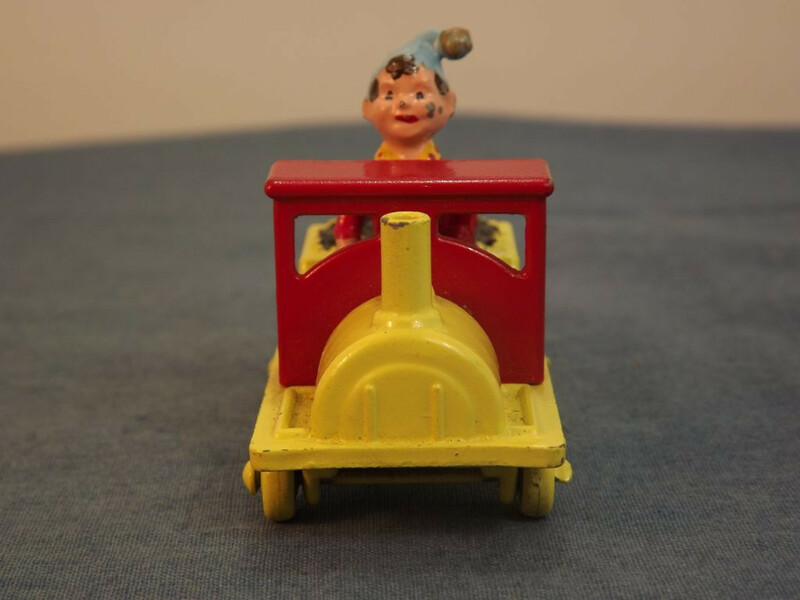 This model was the first to be branded a "Budgie" and was released from 1959 to 1961. This model has no opening parts and no glazing. 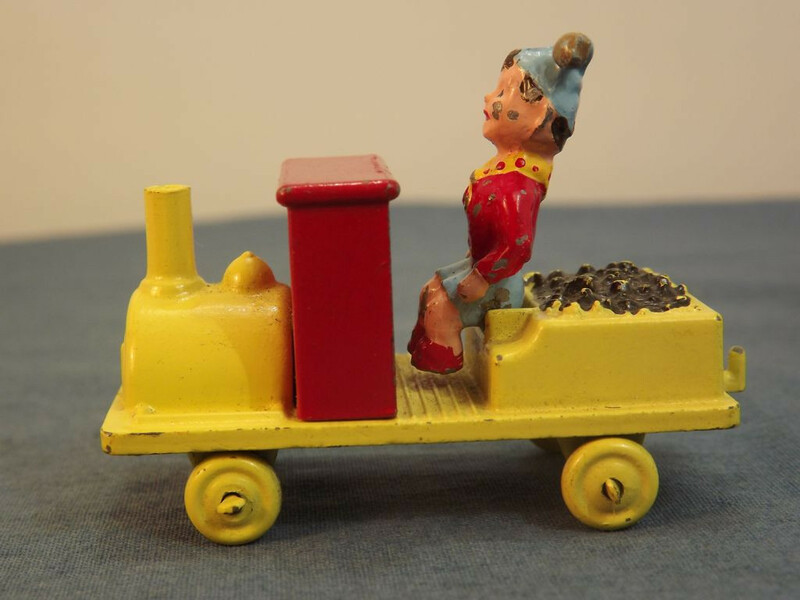 All detail is molded into the body (a three piece casting for the engine) including a boiler door, smoke stack, and steam/sand dome to the front of the cab, seat (for Noddy), coal bin, and towing hook to the rear. 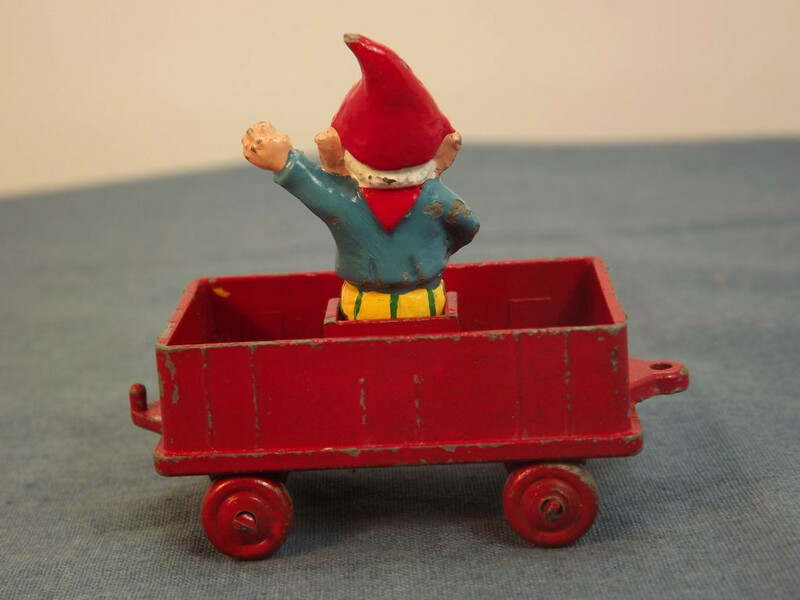 The wagon is a single piece casting with a seat cast into the bed (for Big Ears) and a forward tow slot and rear tow hook. The figures are both molded separately. The engine is yellow with black coal load and dark red cab. 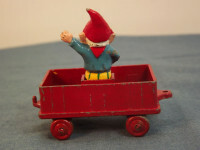 The wagon is dark red. 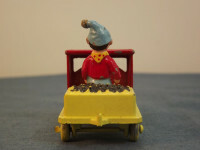 Noddy is painted in his traditional outfit - blue cap, yellow scarf, red jersey, blue shorts, and red shoes. Big Ears is also in his traditional costume - red cap, red scarf (hidden at the front by his white beard) blue jacket, white and red striped shirt, yellow and green striped trousers, and black shoes. 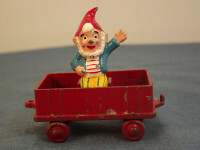 This model also came with METAL figures although most references state the model came with plastic figures. 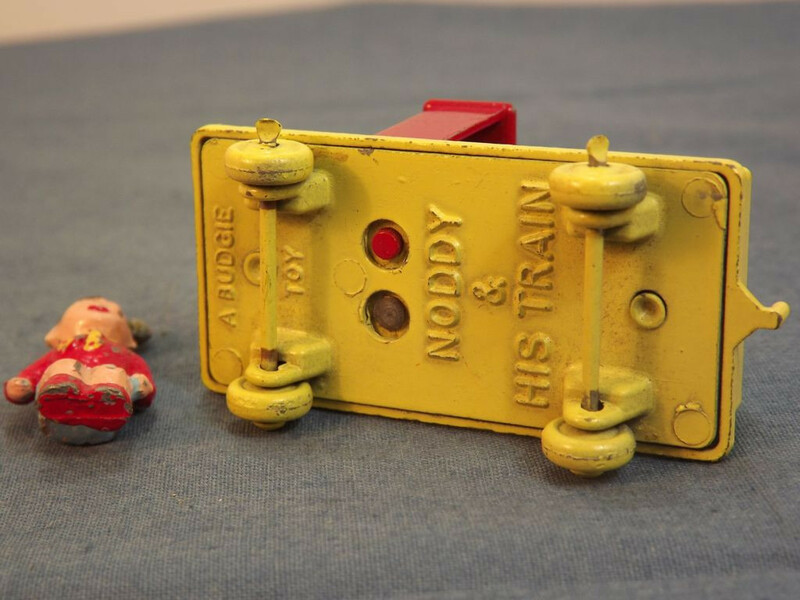 The engine base is painted metal and is marked with "A Budgie, Toy" on two lines spanning either side of the front rivet, forward of the front axle, "Noddy, &, His Train" on three lines in the centre. 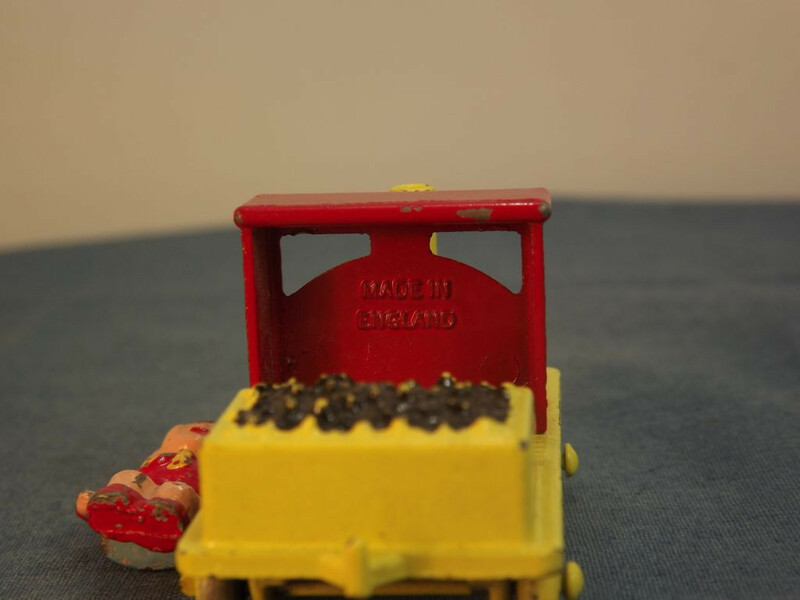 "Made in England" is cast into the cab which is attached to the base by two machined rivets. 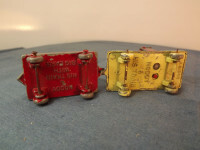 The base itself is also attached to the engine body by two machined rivets. 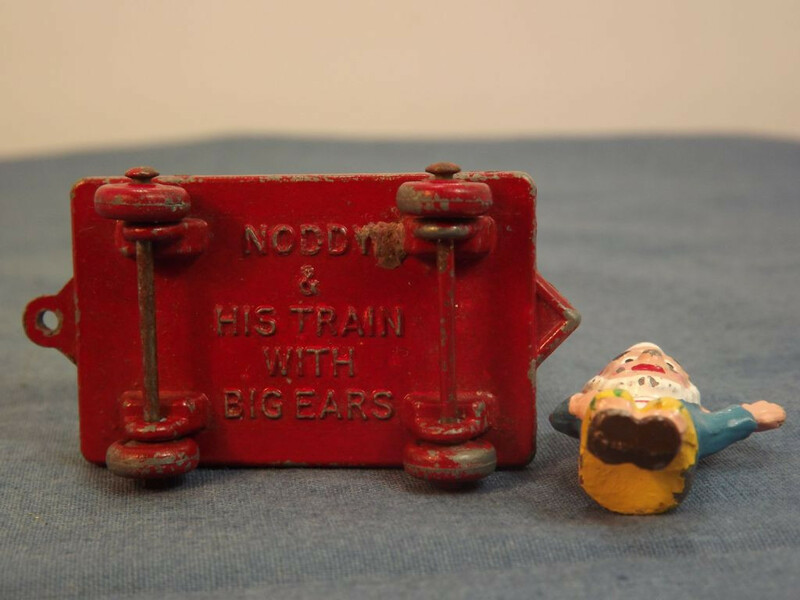 The base of the wagon is part of the body casting and is marked "Noddy, &, His Train, With, Big Ears" on five lines between the axles.